No sung texts. Synopsis provided. It’s satisfying to see the Hallé under Sir Mark Elder maintaining its long tradition of performing Wagner, one that stretches back to the time of its principal conductor Hans Richter (1843-1916), who was a Bayreuth veteran. In the year that Elder, a stalwart Wagnerian, turns seventy, it’s fitting that the Hallé has released a concert performance of Wagner’s music drama Parsifal, recorded live at the BBC Proms in 2013. 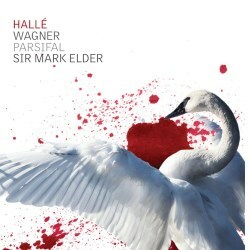 Elder has been presiding over the Hallé’s Bridgewater Hall, Manchester, concert Ring cycle with own label releases of Gotterdammerung and Die Walküre performed back in 2009 and 2011 respectively. A Das Rheingold given in 2016 is yet to be released and a concert staging of Siegfried is scheduled for 2018. Though clearly not to everyone’s taste and a matter of some controversy, performances of operas have a place in concert halls, though this is more especially so in the case of works that would otherwise not be performed. Wagner’s final and most enigmatic score, Parsifal, was written specifically for the Festspielhaus, his self-designed festival opera house at Bayreuth. Based on the Parsifal legend and the knights of the Holy Grail, the primary source for the composer’s own libretto is Wolfram von Eschenbach’s epic medieval poem Parzival, though he applied his own wide ranging personal philosophy to the ancient narrative. Wagner termed Parsifal a Bühnenweihfestspiel (stage consecration festival play), an apt description as an atmosphere of sacred devotion lays heavily over the work. Countless opinions have been given about the core message contained in the controversial score to Parsifal. I was interested to hear the viewpoint of stage director Uwe Eric Laufenberg who gave a new production of Parsifal at the 2016 Bayreuth Festival, “This piece basically focuses on the religion of Christianity. On one hand, the grail knights in ‘Parsifal’ inhabit a realm of charity, empathy and sympathy, and they come to the aid of the needy. Then there's the other side: a crucified God, blood rituals and military symbolism. I believe that Wagner wanted to bring out the factors of benevolence and mystery in this work. Not to openly criticize religion, but to enable one to experience it.” To me Parsifal is about enlightenment through compassion as the way to find eternal redemption, a concept that comes through in the finest performances. Parsifal, a young knight, is sung by tenor Lars Cleveman, who has sung at the Bayreuth Festival. With his delightful ringing tone he gives a fine performance, although ideally I would require a more heroic-sounding tenor. In my mind’s eye, I can’t help thinking back to Stuart Skelton’s shining performance in the role for ENO in 2011. Following the withdrawal of Robert Holl, the part of elderly Knight of the Grail Gurnemanz is taken by Sir John Tomlinson, a seasoned Wagnerian. Defying the years, Tomlinson (then approaching his seventies), is extremely comfortable in this demanding role, which he knows well. Striking are the range of nuances he can produce vocally. Thankfully, his heavy vibrato never intrudes too much. It’s a shame we can’t see Tomlinson’s considerable acting prowess, although we gain some dramatic sense of it vocally, especially of the wizened and dejected knight in act three. An experienced Wagnerian, Katarina Dalayman (soprano) knows well the Magdalen role of the wild woman Kundry and is dramatically first-rate in her emotional extremes. Here extremely attractive voice has a creamy tone in her low to mid register, but I do find her uppermost reaches slightly uncomfortable and bordering on the indistinct. Excelling as a suitably tormented Amfortas, ruler of the Grail Kingdom, Detlef Roth, a late replacement for Iain Paterson, first sang the role at Bayreuth – one of a number of his Wagner roles. Singing resolutely, expertly articulating the text, Roth’s baritone has both clarity and colour, together with a noticeable but unobtrusive vibrato. As the villainous sorcerer Klingsor, baritone Tom Fox is in fine, durable voice, being clear and expressive. Bass Reinhard Hagen satisfies in the role of Titurel, the father of Amfortas, bringing a dark tone that resonates splendidly. Employing some of the spatial possibilities of the Albert Hall, the Trinity Boys Choir and Hallé Youth Choir are positioned high up in the gallery together with some brass players. The Royal Opera Chorus is down on the stage with the orchestra. These are creditable performances all round from the unified choruses, adding greatly to the success of the performance. Elder directs proficiently and with assurance, though his choice of speeds is generally too slow for my taste and at times the performance feels a touch laboured. Some have suggested that Elder may have been modelling his performance on the measured tempi of the late Sir Reginald Goodall. A press release to the album explains that the remastered sound, taken from multitrack recordings of the Albert Hall performance and rehearsals, has been edited to remove audience noise and remixed. I have no problem with the sound quality, which is first-rate, clear and well balanced. At the conclusion of the performance, the audience applause and cheers have been left in. Disappointingly neither sung texts nor any essay about the work itself are provided in the booklet: However, there is a helpful synopsis and a tracking listing which curiously omits to identify the role(s) singing. The notes state that the libretto and English translation can be downloaded free from the Halle website. Invaluable is my copy of the original Parsifal text and English translation published by G. Schirmer. The recording of Parsifal that I have the most affinity for is the classic live 1962 Bayreuth Festival account of distinction conducted by Hans Knappertsbusch with George London (Amfortas), Martti Talvela (Titurel), Hans Hotter (Gurnemanz), Jess Thomas (Parsifal), Gustav Neidlinger (Klingsor) and Irene Dalis (Kundry), released on Philips – see review by Tony Duggan. This Hallé recording of Parsifal under Sir Mark Elder doesn’t quite have the distinction to place it alongside the haunting and profoundly spiritual Knappertsbusch account but it’s a fine achievement, a credit to all concerned.